Last chance to order t-shirts! We’re still taking last-minute orders for t-shirts! You can order through Wednesday, March 25th. Ordering details are located here. And just a reminder that you don’t need to be taking part in the 5k to order t-shirts. So if you just like the design and/or you want to sport the Baty Sisu colors, please feel free to send me your order! So far we’ve had 70 requests for t-shirts…we’re once again overwhelmed by the support for Chris! T-shirts are $9 (not $10…that was my typo, sorry about that). Any extra money will be donated to the Colon Cancer Coalition. I survived round 2 which was the folfiri group of chemicals along with Avastin thrown in for good measure. My list of drugs over the past few days: Caffeine, Vicodin, Avastin, Atrapene, a steroid, Benadryl, Leucovorian, FU5, Irinotecan, Tylenol, Zantac, Zofran, Composine, Neulasta and trazadone. 15 chemicals in 4 days-yeah my system is a little out of wack. This round definitely hit me harder than the last one-like twice as hard. The doctor said even though I had an 8 week layoff during Jan/Feb. the chemo. still has a cumulative effect. From 4 p.m. Sat. through 7 a.m. this morning I was in bed except for 1.5 hours. Mainly I am nauseated and tired. I almost didn’t have chemo. this round. My white blood cell count was extremely low-I just barely made it. I had less than 1/2 of what I had last time they checked. That is not a good thing with two little boys at home who have been sick since last Monday. By God’s grace I have not caught any of their colds, strep or flu over the past 6 months(of course this means I will probably come down with something tomorrow-but it has been a miraculous run!). I feel relatively good today. My head finally cleared about 10:30 this morning. I have a tremendous back ache, which is still probably left over from shoveling, walking the dog, carrying my nephew around and the Neulasta shot I got on Friday. On the hair watch….I still got some. The Dr. guessed somewhere around the 17, 18,19 or 20th day of this regiment it would start to fall out. Today is day 18-stay tuned! I just want to take the rest of this time to say “thank you” to everyone! You are an amazing group of people! Just for taking the time to read this blog and thinking about our family/praying for our family and sending your well wishes. Thank you for all the donations that you have sent to our 5K event April 19th. We are still the number one team and are still growing in terms of participants and dollars. A special thanks to Brian Banick and Vicki Starbeck for taking care of me during this past chemo round-I couldn’t have made it without you two. Also a special thank you to my Mom who came down and took care of the boys during this past week when they were sick and Sarah our team captain who has organized our 5k and got the t-shirts prepared. I’m not sure how I will pay all of you back for all the stuff you have helped me out through on this journey, but keep track of those IOU’s someday I will pay you back. For now I just ask that God blesses you all for taking the time to read and care! p.s. Pray for a Cure is tomorrow night at my church from 7-9 p.m., anyone is welcome. The shirt has the Finnish Coat of Arms on the front, and on the back it describes Sisu. If you want a t-shirt, get your order in now! Ordering details are in the previous blog post. 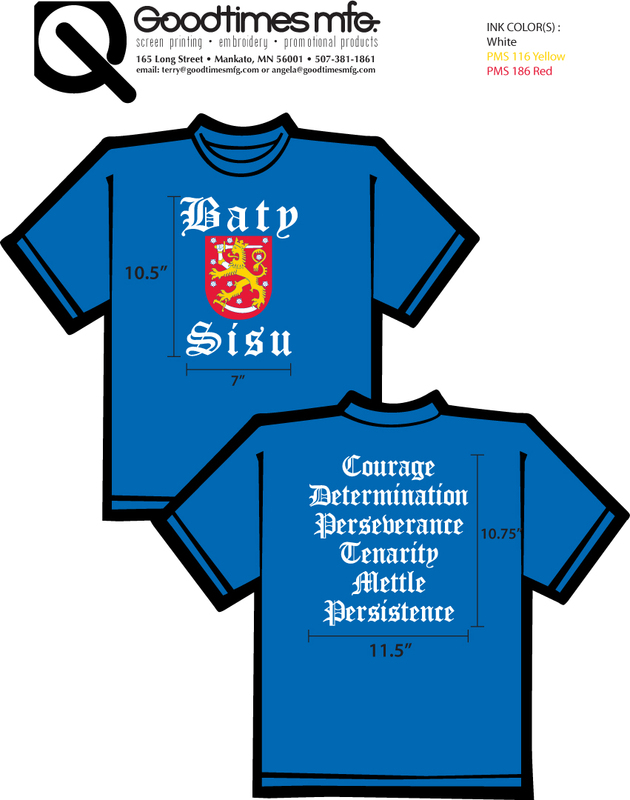 Baty Sisu T-Shirt Order – Order Yours Now! We decided to get team Baty Sisu t-shirts made for the Get Your Rear in 5k. We are opening this t-shirt order up to everyone, so you don’t need to be a team member to order the t-shirt. Please send me an email (with the subject line “Team Baty Sisu t-shirt order”) and send me your t-shirt size. If you’re ordering for others, please be sure to send me their sizes as well and specify men’s, women’s, or youth. The t-shirt cost is $9. Checks can be written out to Sarah Stratton (and I’ll submit one big check for the whole t-shirt order). When you send me your order, I’ll send you my address so you can mail me your check (please note that it may take me a few days to get back to you). I would like to submit the order to our t-shirt vendor by March 23rd, so please have your orders and checks in before then! I will post the t-shirt design as soon as possible…hopefully later this week. p.s. The Semi-Colons have their work cut out for them if they want to try to beat the top fundraising team, Team Baty Sisu. Bring it Pat! !